BACKGROUND: Stratified Back care is a recently developed method for treating low back pain. PURPOSE: This study compared the effects of two stratified care approaches (sub-grouping for targeted treatment [STarT] and specific treatment of the problems of the spine [STOPS] in patients with nonspecific low back pain [NSLBP]). MATERIALS AND METHODS: Forty-six individuals, with NSLBP, participated in this single-blinded, randomized clinical trial. Participants were randomly assigned into one of the two groups: STarT Back Group (n = 23) or STOPS group (n = 23). Treatment was applied twice weekly for 8 weeks. Outcomes assessed pre- and post-interventions were pain intensity (PI) using numeric pain rating scale and functional disability (FD) using the Oswestry Disability Index. Participants in both groups were comparable in age (44.65 ± 9.03 vs. 46.40 ± 7.39) years. At baseline, PI, FD, and anthropometric values were comparable in both groups. RESULTS: The Results showed a significant difference in PI between the STarT and STOPS with a mean difference of −1.24 and 95% confidence interval (−0.86 to −0.04), P < 0.05, with no significant difference in FD, P > 0.05 between the groups. However, there was a significant difference within each group in pain and FD with P < 0.05. CONCLUSION: It was concluded that STarT Back approach was more effective in reducing PI only than STOPS approach in individuals with NSLBP. This study was a single-blinded randomized controlled clinical trial design, registered with Pan Africa Clinical Trial Registry PACTR 201707002001797. Consecutive sampling technique was used to recruit participants for the study as they become available in the Outpatient Department of Physiotherapy department, Aminu Kano Teaching Hospital, Kano. The participants were screened to determine whether they met the inclusion criteria for the study. The participants for this study were patients with NSLBP, who were able to comprehend instruction in English or Hausa language, and were not involved in any other treatment during the study. 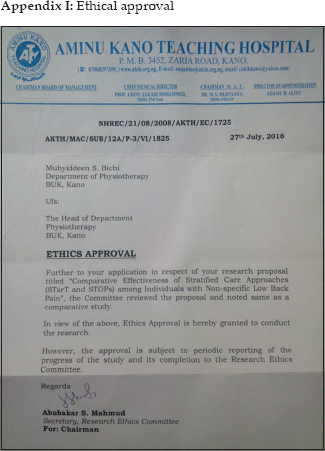 Ethical approval was sought and obtained from the Research Ethics Committee Aminu Kano Teaching Hospital, Kano, Nigeria, (AKTH/MAC/SUB/12A/P-3/VI/1825) [Appendix I]. The following categories of patients were excluded from the study: Patients with a history of a prior surgery to the lumbosacral spine; patients with evidence of systemic disease, carcinoma or organ diseases; and patients with evidence of pregnancy and patients who are below 18 years. The consented participants were randomly allocated into two groups: STarT Back group (SBG) (n = 23) and STOPS group (SPG) ((n = 23). See [Figure 1] on flowchart of the participants' recruitment. Subjective complaints questionnaire: This questionnaire was used to get the subjective information of the patients relating to the history and pattern of back pain, especially those in SPG, and was also used to determine the type of treatment that SPG received [Appendix III]. High risk: This builds on the low- and medium risk packages. The aims are to reduce pain, reduce disability and improve psychological functioning. It also emphasizes on providing adequate combined physical and cognitive-behavioral approach. 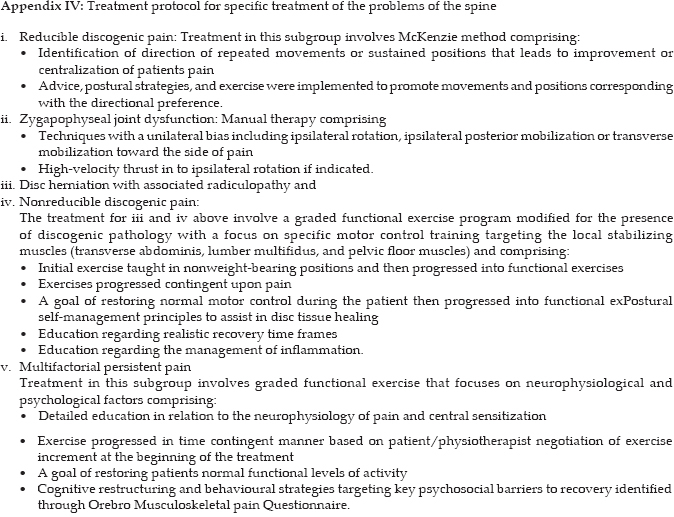 Multifactorial persistent pain: Treatment in this subgroup involves graded functional exercise to restore patients normal functional levels of activity with more emphasis on; cognitive restructuring and behavioral strategies targeting key psychosocial barriers to recovery, detailed education in relation to the neurophysiology of pain, and central sensitization identified through Orebro Musculoskeletal Questionnaire. Descriptive statistic of frequency and percentage was used to describe the sociodemographic characteristics of the participants as shown in [Table 1]. Inferential statistics of paired and independent t-test were used to determine the statistical differences in clinical variables within and between groups. 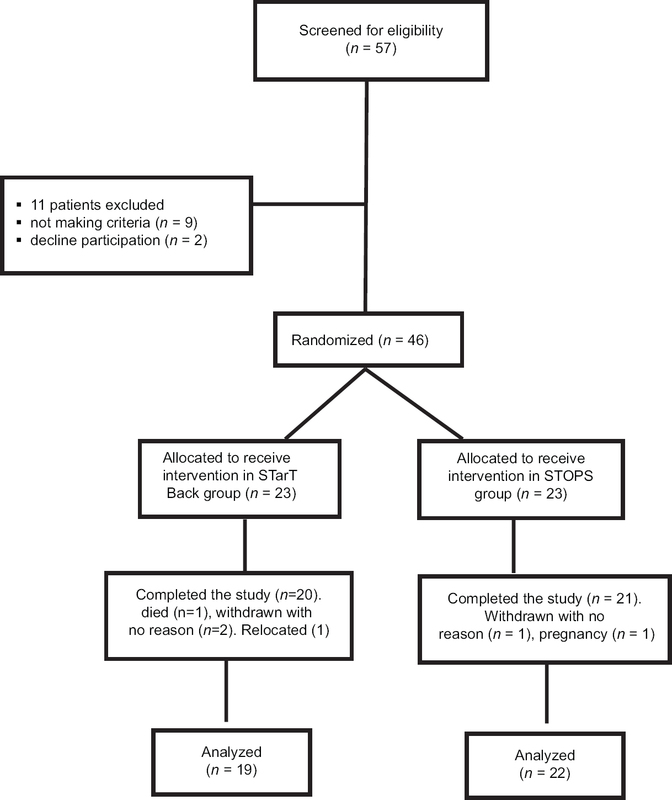 One-way ANOVA was used to determine the statistical differences in clinical variables (pain and FD) across phases (baseline and 8 weeks postintervention). All statistical analyses were performed with alpha levels set at 0.05, using Statistical Package for Social Sciences (SPSS) version 16.0 software (SPSS Inc. Chicago, Illinois, USA). [Table 2] shows the comparison of pre- and post-treatment outcome scores within SBG after 8 weeks of treatment. The result indicated a significant difference in PI (P = 0.001; t = 9.51). 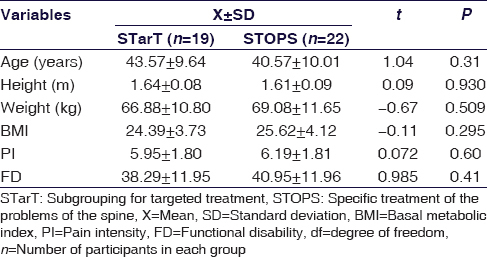 Similarly, significant difference in FD within the group was noted (P = 0.001; t = 10.72), with reduced mean in PI and FD 8-weeks postintervention. The comparison of pre and 8 weeks posttreatment outcome scores within SPG is presented in [Table 3] shows the result indicated significant difference in PI between pre- and post-treatment scores (P = 0.001; t = 8.09). However, there was a significant difference in FD (P = 0.001; t = 9.53), with marked reduction in mean scores of PI and FD posttreatment. [Table 4] shows the result of independent t-test between the two groups (STarT and STOPS) which indicated a significant difference in PI between the two groups (P < 0.05) with no significant difference in FD between the groups (P = 0.25). 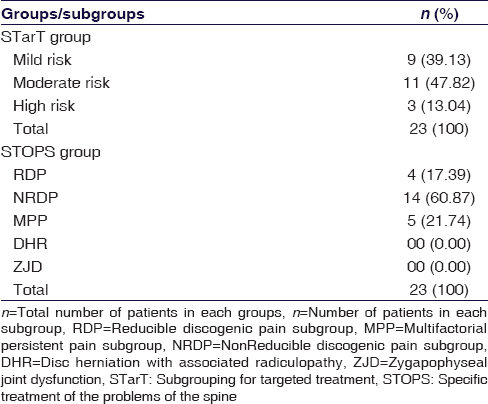 In the SPG, majority of the study participants (60.87%) were of nonreducible discogenic pain subgroup as compared to the (47.82%) moderate risk level in the SBG. There was also a discrepancy in the percentage of participants in the mild versus reducible discogenic pain subgroups in both groups. SBG had 39.13% while SPG had 17.39% as shown in [Table 5]. This may also be responsible for the better response seen in the SBG as stated by Keele tool that individuals classified under the mild-risk group will recover with only back care education and maybe few sessions of therapy. In general, there were more patients with mild risk in SBG when compared to those in SPG, (39.13%) versus (17.39%) and relatively more patients with moderate- and high-risk level in SPG as seen in [Table 5]. As such, the aforementioned reason could be a contributing factor or potential reason why STarT Back approach was more responsive to change in PI than with STOPS approach and showed no difference for FD. Hoy D, Bain C, Williams G, March L, Brooks P, Blyth F, et al. Asystematic review of the global prevalence of low back pain. Arthritis Rheum 2012;64:2028-37. Maluf KS, Sahrmann SA, Van Dillen LR. Use of a classification system to guide nonsurgical management of a patient with chronic low back pain. Phys Ther 2000;80:1097-111. Cherkin DC, Sherman KJ, Kahn J, Erro JH, Deyo RA, Haneuse SJ, et al. Effectiveness of focused structural massage and relaxation massage for chronic low back pain: Protocol for a randomized controlled trial. Trials 2009;10:96. Foster NE, Hill JC, Ozed controlled trial. 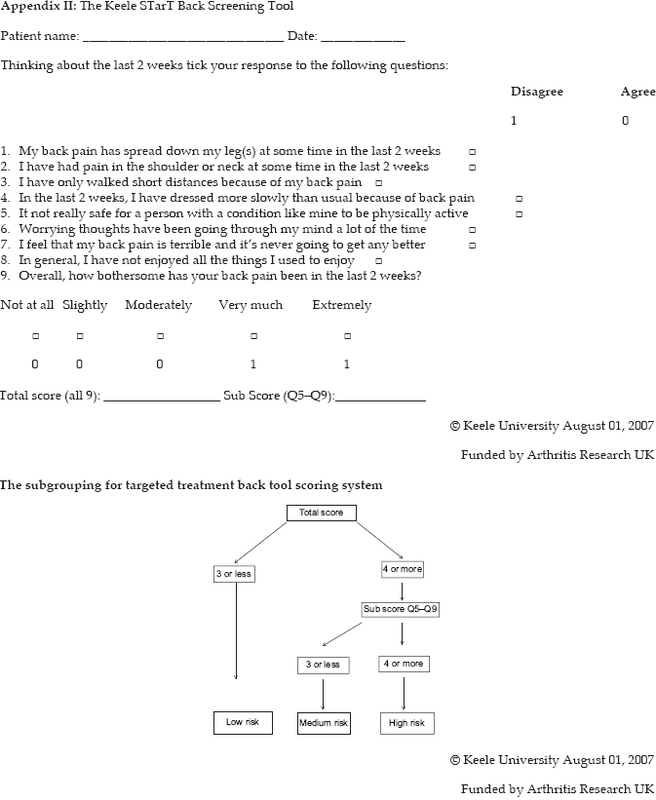 Trials 2009;10:96.assage for chronic low back painn RheumatoPhysiotherapy 2015;101:e17-8. Fritz JM, Delitto A, Erhard RE. Comparison of classification-based physical therapy with therapy based on clinical practice guidelines for patients with acute low back pain: A randomized clinical trial. Spine (Phila Pa 1976) 2003;28:1363-71. Karayannis NV, Jull GA, Hodges PW. 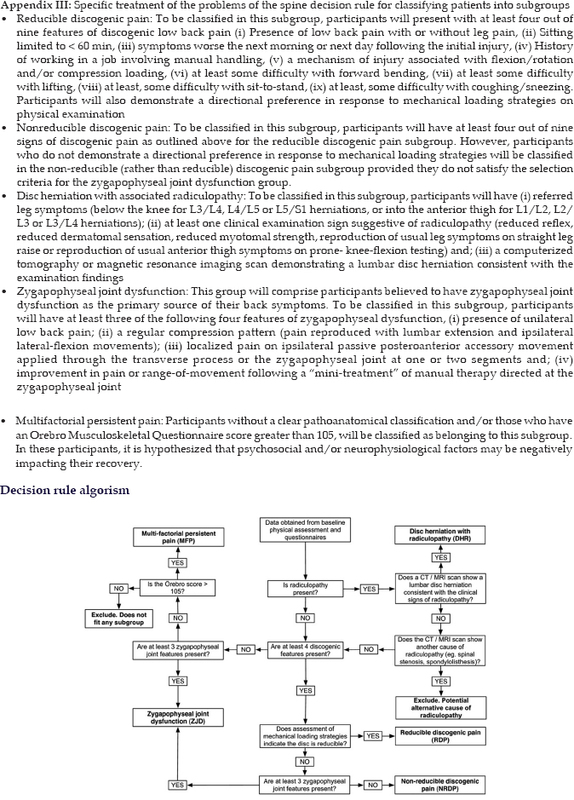 Physiotherapy movement based classification approaches to low back pain: Comparison of subgroups through review and developer/expert survey. BMC Musculoskelet Disord 2012;13:24. Rampersaud YR, Bidos A, Fanti C, Perruccio AV. The need for multidimensional stratification of chronic low back pain (LBP). Spine (Phila Pa 1976) 2017;42:E1318-E1325. Chou R, Atlas SJ, Stanos SP, Rosenquist RW. Nonsurgical interventional therapies for low back pain: A review of the evidence for an american pain society clinical practice guideline. Spine (Phila Pa 1976) 2009;34:1078-93. University K. STarT Back Tool, Keele University. Keele Univ. Available from: https://www.keele.ac.uk/sbst/startbacktool/. [Last accessed on 2018 February 25]. Hill JC, Whitehurst DG, Lewis M, Bryan S, Dunn KM, Foster NE, et al. Comparison of stratified primary care management for low back pain with current best practice (STarT back): A randomised controlled trial. Lancet 2011;378:1560-71.